There are currently 6 research facilities in the U.S. Their goal: understand the decomposition process, and develop tools and observational techniques to help analyze human remains. 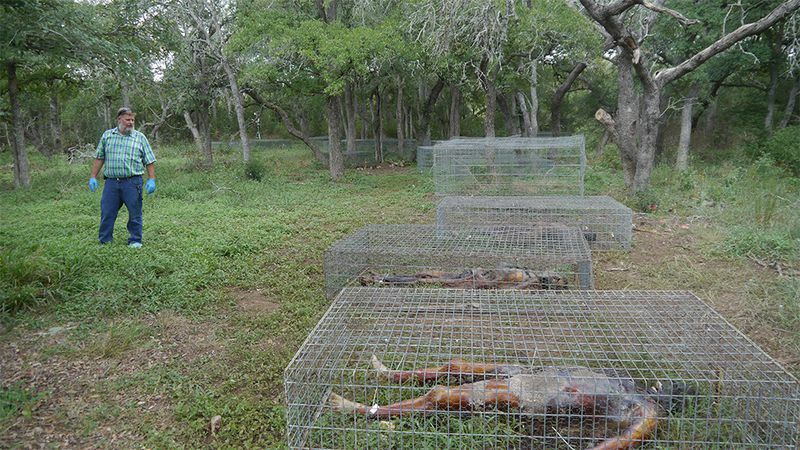 Daniel Wescott, Director of the body farm Texas State at one of many body cages. (2-6 days after death) The body starts to decompose internally, and swells because of gas build up. Skin starts to rupture, and those gasses and other chemicals are released that attract flies. (5-11 days after death) Arguably the most gruesome part, fluids are forced out of body openings and soft tissues. Oh, and the carcass deflates. Maggots have gone to town, and it’s a generally unsavory sight. (Days 10-25) Since most of the soft tissue mass has liquefied and been processed, there’s a lot less insect activity. Only dry elements like bones, hair, and cartilage remain. The tougher tissues are being worked on. (Day 25+ ) Pretty much all the tissue is gone, and the skeleton, cartilage, and dry skin are all that remains. The duration of the stages varies based on the surroundings. Hotter temperatures make decay progress faster than colder ones. Decomposition in air is about 2x faster than in water, and 4x faster than below ground. Thanks to body farms, we know everything above plus sordid details that are better left up to your favorite Halloween thriller. Tagged decay, nature, science, The Wild. The world is out to get you! Can Mushroom Juice Save the Honeybee?